Today’s review unit was shipped from the city of Brea, California, USA to us here in Calgary, AB, Canada. Although you may see a really small dent at the top right of the parcel, there was actually no sign of unacceptable damage on the shipping box itself. There is no need to be nervous about the safety of the tempered glass window panel after over a thousand miles of transportation -- well done FedEx International Economy. The box was rather big and heavy, which I felt pretty excited about, since there would surely be lots of good stuff in it. Usually, a good retail package design can draw people’s attention and make the product itself stand out among hundreds of other products on the shelf. However, the reign of a computer case is different. Most of the time, the dealer will either directly put sample cases on the shelf or just demonstrate some fully built computers using those chassis. I personally would not buy a computer case just because it looks great on the box. 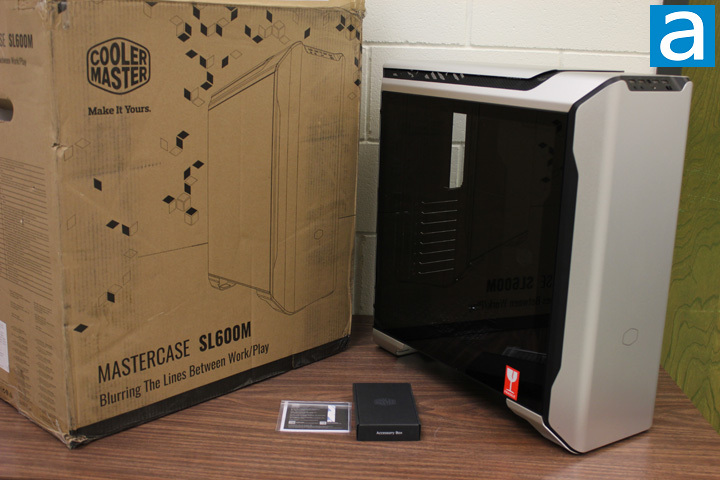 The retail package of MasterCase SL600M, which is also the shipping package, is essentially a cardboard box with its original color. One sketch of the case is shown on the front cover of the box. The company’s name and famous “Make It Yours” slogan are presented at the top left corner. In the bottom, there is the model name of the product. 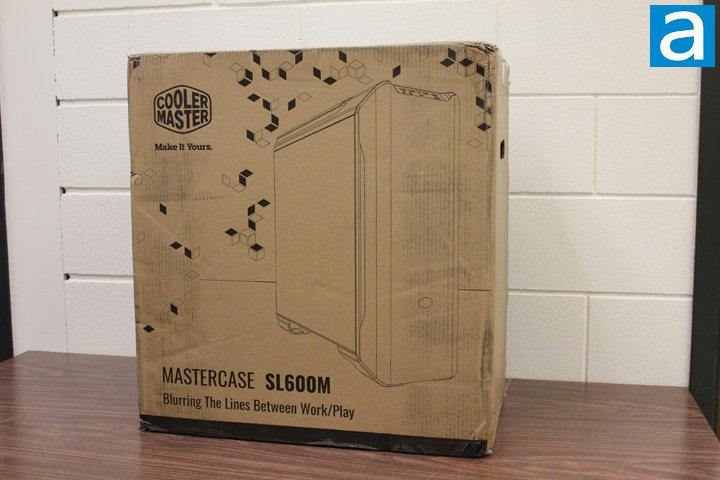 The retail box design of MasterCase SL600M is simple, so if you were looking for more information, I would recommend looking at Cooler Master's website. Upon opening the box, you will see the case is wrapped inside a big plastic bag. The bag provides protection to the case from scratches and other surface damages. Aside from the plastic bag, no other protection was provided for the tempered glass window. However, there is a sticker on the tempered glass window indicates that this product, at least this side, is fragile. I would prefer the sticker to be put on the outside of the shipping box too. Furthermore, two foam brackets are used to secure the computer case while it is in the box. The whole chassis is supported by the two brackets at the corners, such that there is no direct contact with the shipping package and thereby no damage was found on the case. To allow for quick installation, a small user manual is included in the package. Since computer building is not rocket science, there is no demand for a book-like user guide, but it is nice to see. All the accessories, including hardware and zip ties, are contained in a black cardboard box. posted 3 hours and 41 minutes ago, with 1 posts. posted 3 hours and 42 minutes ago, with 2 posts. posted 3 hours and 42 minutes ago, with 8 posts. posted 3 hours and 42 minutes ago, with 7 posts. posted 3 hours and 43 minutes ago, with 7 posts. posted 3 hours and 46 minutes ago, with 15 posts. posted 3 hours and 47 minutes ago, with 59 posts. posted 3 hours and 47 minutes ago, with 14 posts. posted 3 hours and 47 minutes ago, with 11 posts.